The Newman Center is a place steeped in Catholic Christian faith and practice. However, part of our mission has been to create a welcoming atmosphere of hospitality to all who visit here. Following the example of Jesus, the Newman Center and its leaders seek to provide warmth and hospitality to all regardless of one’s religious belief or practice. Our Campus Ministry provides opportunities for members of all faith traditions to encounter God as they work, study and live life to the fullest. Regardless of the faith background that you bring to this place, we at the Newman Center seek to meet you where you are and to accompany you as you grow into the person that God has created you to be. 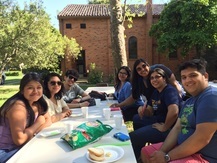 In collaboration with the University Religious Council (URC) and the Interfaith Campus Council (ICC) at UC Davis, the Newman Center aspires to create opportunities for our members to experience the culture and practices of different faith traditions.